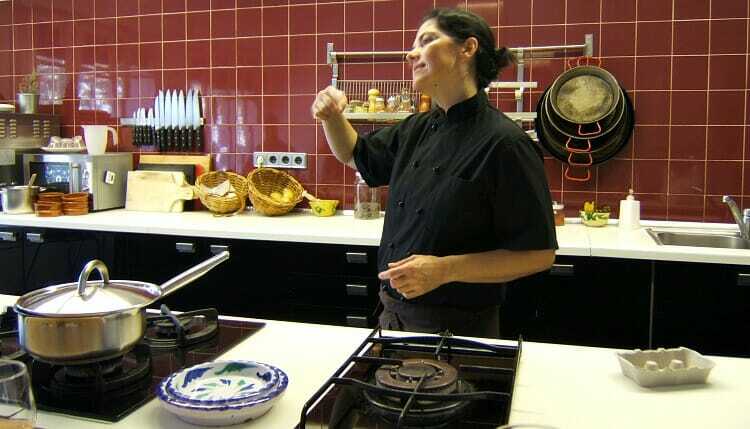 In the course of planning a trip to Barcelona, I signed up for a cooking class which promised to teach me how to make some traditional Spanish dishes. I was a bit leery as the website indicated that the classes were geared for tourists, but I crossed my fingers, booked the optional market tour, and hoped for the best. On the appointed day, a small group of travelers, (a few, like myself, solo travelers) , trudged up a steep staircase to find an apartment converted into a huge kitchen area, with a small office and washroom. I was in the Cook and Taste cooking school. Stools lined one side of a long counter, while huge windows looked out over La Rambla. 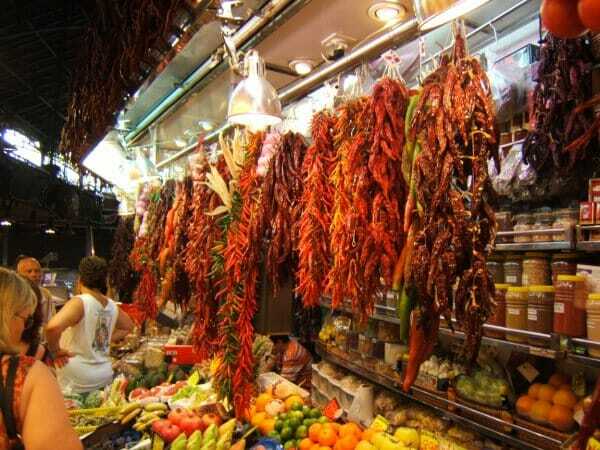 Once gathered and introduced to one another, we set out for a tour of the famous Boqueria Market . What a treat to have a skilled guide! Our instructor showed us what to buy, who to buy it from, and where to eat when we were finished shopping. The chef shared lots of tips about both cooking and where to shop and dine in Barcelona. Back in the kitchen, we unloaded the ingredients that we had gathered, and got down to work. The interactive class format allowed for as much or as little participation as desired. My classmates and I, hailing from the United States, Sweden, the UK, Canada, France and Australia were an enthusiastic bunch. We chopped and stirred, listened and laughed, and ate and drank our way through the next few hours. We created – then ate – everything from a delicious cold tomato soup topped with a mound of idiazabal cheese to a classic tortilla to chicken paella to crema catalana. 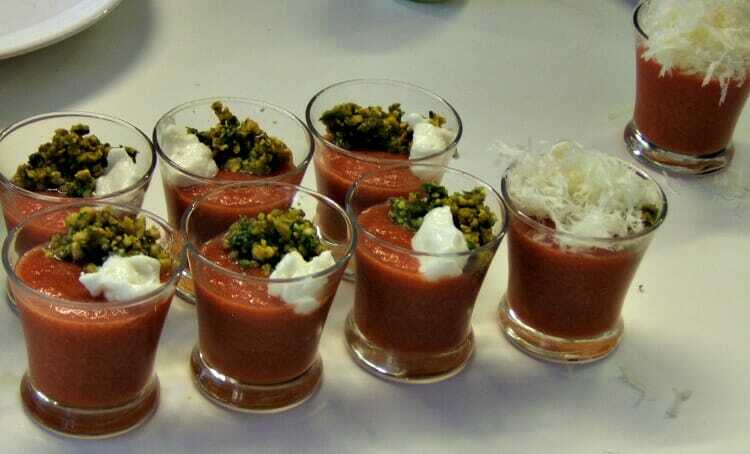 Delicious cold tomato soup topped with basil, nuts, idiazabal cheese…mmm. The free-flowing wine may have contributed to us overstaying our scheduled class time, but luckily the chef didn’t seem to mind. We picked her brain for restaurant recommendations, shopping tips and all manner of food and wine-related topics. My fears that this would be a low-level, touristy outing proved unfounded. In fact, our instructor was a chef from a Michelin-starred restaurant in Barcelona. She gave us a peek into the world of a top female chef in a male-dominated profession, in a cultural context very different from my own. It was fascinating. Taking a cooking class is a great option for solo travelers. You can learn a lot about the local food and culture, pick up a new skill, then dine with your new-found friends. You also leave with all of the recipes, so that you can recreate the meal, and relive your trip, back at home. I loved it! And that’s not just the wine talking.